This is for you if you want to change YOUR workplace or community for the better as a Wellbeing Champion. Wellbeing Champions work is based on a foundation in the 5 Ways of Wellbeing. This two-day programme equips participants to spread a culture of wellbeing where they work and live. 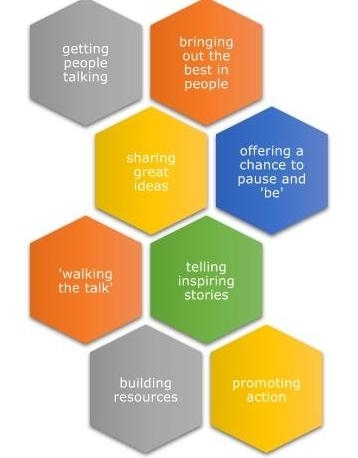 The diagram below shows some of the many ways it invites people to make a difference. The two days of learning involve an emersion in the ways of wellbeing, what they are, why they matter, how they work, and how to embed them in your everyday life for good. It includes some of the background to the science of wellbeing and pyschology, to help you understand how to make it ‘stick’ in the culture of your team. Over the two days you’ll learn about he ways people learn, facilitation, planning, presentation and approaches to change, so you’re ready to embed wellbeing into the heart of your organisation or community. You’ll be one of around 200 Wellbeing Champions based all around the UK, who are encouraged to share the best of what works. We’ll shortly launch a private learning forum full of resources designed to help you and your communities to thrive. Wellbeing Champions are non-commercial appointments. 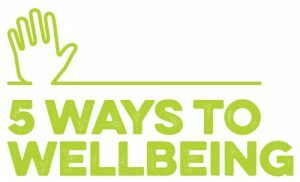 Those who qualify can share the 5 Ways of Wellbeing freely in their own organisations or with not-for-profit groups and charities in local communities.